This entry-level Cortese is perfectly crisp, light white wine that is sure to please all tastes. Straw yellow in color, it presents a clean bouquet of fruity aromas of citrus and mineral notes. Light and zesty. Serve well chilled with light appetizers, seafood-based first courses, summer salads and white meat dishes. 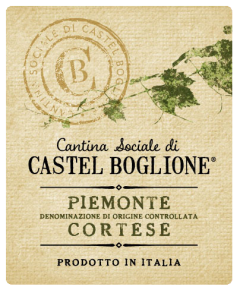 The Cortese variety has been grown in the southeastern part of Piedmont for hundreds of years, and is mentioned in documents that date back to the beginning of the 17th Century. It has long been considered as Piedmont’s finest white variety and is often credited as introducing the world to Italian white wine. In recent decades it was usurped somewhat by other white wine varities such us Arneis and Moscato, but it is making a comeback, especially as the main varietal used in the Gavi DOCG appellation, Piedmont’s white crown jewel. Grapes are harvested in September then pressed gently and fermented with selected yeasts in stainless steel tanks at controlled temperature.